Contact us to schedule a short interview by phone or email. You supply the details, we'll do the rest! Since 2010, OLG has partnered with WWF-Canada on the Living Planet @ Work program, which empowers employees across Canada to drive sustainable practices in their workplace. Through this partnership, we’ve learned that the lottery and gaming agency has also taken great strides to reduce its own environmental impact and engage its workforce at the same time. 1. OLG reduced its paper use by an average of 21 per cent over eight years, equal to around 68 million letter-sized pieces of paper per year. How they did it: According to Noel Padilla, OLG’s Sustainability Manager, paper saving measures included reducing the size of online lottery tickets by 25 per cent starting in 2010, and encouraging employees to adopt office paper saving practices such as duplex printing, sending e-memos, and online document approvals. These savings were validated by third party paper vendors through their delivery reports. Key tip for success: Padilla notes that OLG had to get creative to reach its paper reduction goals. One example of a simple action they took was to change the font on their lottery tickets in order to minimize the ticket's blank spaces. What you can do: Check out our Paper Actions resource to find opportunities for your company to reduce the impacts of paper use. 2. Although there was an increase of 19 per cent in the total square footage of its facilities in their 2014-15 fiscal year, OLG reduced its annual energy use by 5.5 per cent between 2011 and 2016, resulting in annual cost savings of $694,000. How they did it: OLG audited its energy use at its facilities to determine potential reductions. Based on the audit results, OLG worked with a number of employees at different levels and in different roles to switch the standard incandescent lighting in their facilities to more energy efficient LED lighting. OLG also installed energy-saving equipment such as variable frequency drives in some of its facilities. Key tip for success: Padilla advises that the key to energy reduction is knowing where consumption can be reduced through audits and implementing the appropriate actions based on the audit results. Another strategy is to take advantage of government programs and rebates to reduce the cost of the improvements. What you can do: Check out our Energy Actions resource to find opportunities for your company to reduce its energy impact. 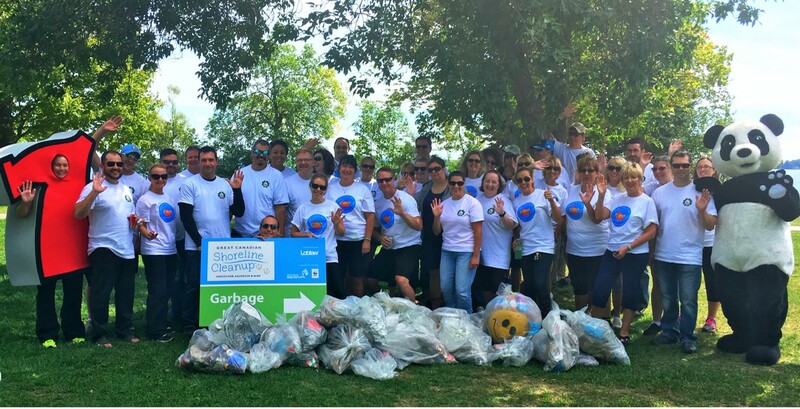 © OLG employees participate in a Great Canadian Shoreline Cleanup to combat shoreline litter. 3. From 2009 to 2016, OLG reduced its GHG emissions by a total of 19,300 tonnes, equivalent to the amount produced by around 4,000 standard size homes annually. How they did it: In addition to the paper and energy savings realized from the initiatives mentioned above, OLG reduced its fuel consumption by switching its vehicle fleet to one that requires much less fuel. Key tip for success: You can’t manage what you can’t measure. If your company is not currently measuring key metrics associated with GHG emissions, it will be much harder to set appropriate goals and reduce your impact. What you can do: Check out our Travel audit guide and energy audit guide for tips on measuring your company’s environmental impact from energy and travel. OLG’s accomplishments demonstrate that small environmental changes can add up to make a big impact. By betting on green, OLG has realized a total of $7.6 million in net monetary benefits from environmental footprint reduction initiatives from 2009-2016, demonstrating that sustainability efforts really can be a win-win for business and the planet. Thank you to WWF volunteer Tamara Latinovic for being a contributor to this Living Planet @ Work champion story.